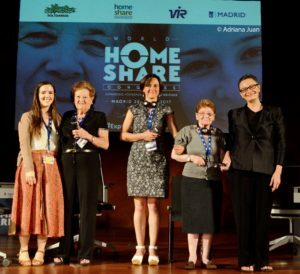 The 5th World Homeshare Congress took place in Madrid, Spain on 25 – 26 May 2017 courtesy of Solidarios. The event, held in Madrid’s wonderful City Hall, the Palacio Cibeles, was our biggest congress yet, with over 140 delegates from 11 countries, some people coming from as far afield as the USA, Australia, Korea and Japan. This was our first bi-lingual congress too, with marvellous simultaneous translation from Spanish/English. Our congratulations and warmest thanks go the organisers – Alfonso Fajardo, Carlos Miguelez and Delphine Liegeois – and their wonderful team of volunteers from Solidarios. They gave us a congress to remember. The congress theme was Expanding homeshare, building bridges and you can read the programme here. It was a wide-ranging programme with something for everyone but most of all with time to make all those all-important connections with other delegates. The presentations are now online, as is the photo album. But the show was undoubtedly stolen by three homesharers, two from Spain, one from the UK, who spoke movingly about what homeshare had brought to their lives. This Delegates Madrid World Homeshare Congress lists those people who gave permission for their details to be shared. Thanks to Solidarios and Adriana Juan for permission to use the photo above. With many thanks to Madrid City Council (Ayuntamiento de Madrid): www.madrid.es and VIR Laboratorios: www.vir.es for their support.